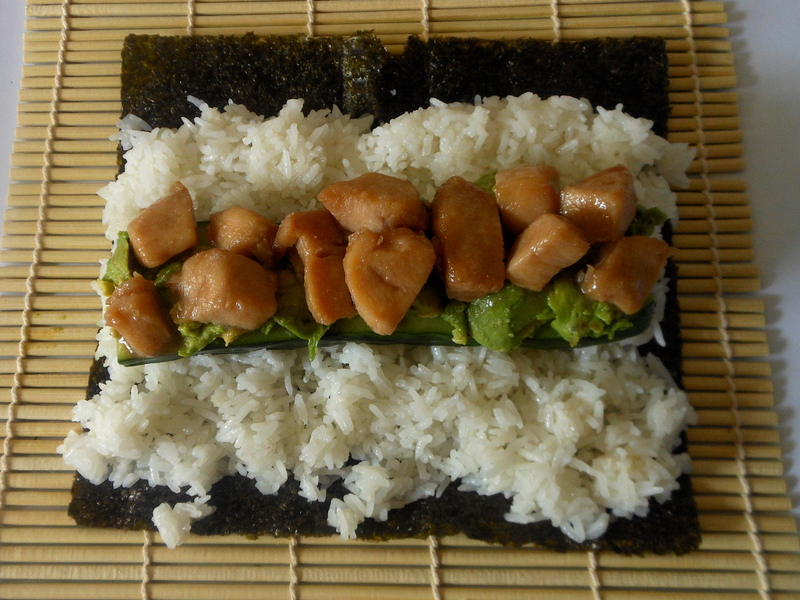 There is perhaps nothing more synonymous with Japanese food than sushi and today, with the help of some online recipes and my Australian Women’s Weekly Cooking School cookbook, I managed to pull off, in a relatively painless fashion, teriyaki chicken norimaki, or sushi rolls. My previous post covered the sushi rice aspect of this recipe and I found a very easy and tasty teriyaki sauce recipe here. The one thing I did different to the recipe was that I omitted the ginger but it still tasted fantastic. 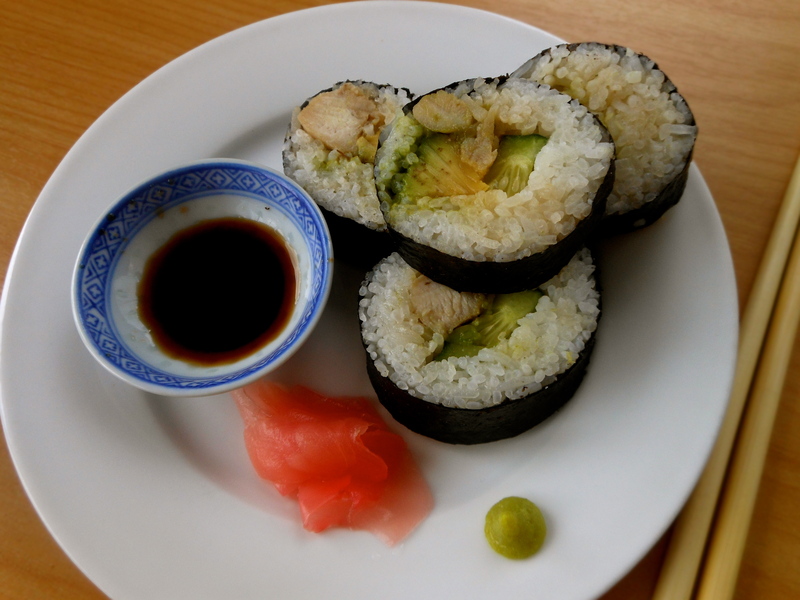 Once the chicken was done and I had the rice covered with a wet cloth ready to be used, I went on to carve up some cucumber and avocado before starting on the sushi rolls. Being the stubborn person that I am though, I managed to squeeze it all together! 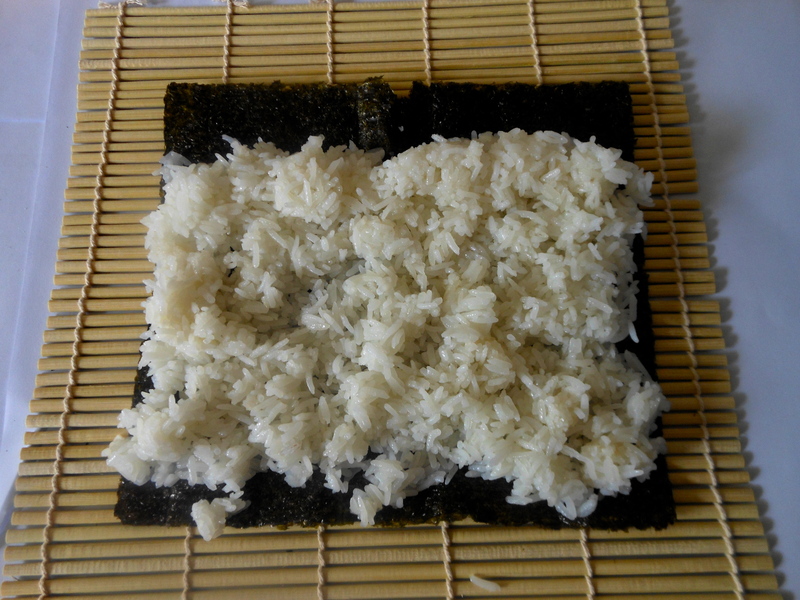 …working from left to right, gently rake rice evenly over nori, leaving 2cm strip on far side of nori uncovered. Build up rice in front of uncovered strip to form a mound to keep filling in place. Starting with edge closest to you, pick up mat using thumb and forefingers of both hands; use remaining fingers to hold filling in place as you roll mat away from you. Roll forward, pressing gently but tightly, wrapping nori around rice and filling. At times I found it really fiddly trying to hold in all the filling and sometimes the end of the nori didn’t stick but somehow I managed to get it all together! Once all the rolling was done, I cut them up as thick, or as thin, as I wanted and served with light soy sauce, wasabi paste and pickled ginger.